The Trans-Pacific Partnership (TPP) has been agreed, but not yet ratified by the relevant legislatures; however, investors may be certain, that it is a significant advance in free trade arrangements, for Asia Pacific nations, which will especially benefit the lower income countries, such as Vietnam, which already see higher GDP growth because of the transfer of manufacturing from China to lower cost locations. India, Pakistan, Sri Lanka, and Bangladesh are all benefiting from this trend; and we see a common theme of rapid “catch-up” from incomes and consumer spending in these large young nations with frontier capital markets. I have just returned from the IMF meeting in Peru, where the forecast for global growth has been lowered 5 times this year to 3.5% for 2016. In my opinion, this is an excessively pessimistic forecast in view of the benefits of lower oil prices, and the global shift in terms of trade towards Asian consumers to the detriment of oil producers in the Middle East, Russia, Nigeria, Venezuela, and other OPEC countries. China has, for example, just reported a 20% fall in imports. As usual, the western press greeted this as a bearish sign of China’s slowdown. The reality is (as the accompanying charts illustrate) that China’s imports by volume have continued to grow, but the value has dramatically fallen because of the oil price and also copper, iron ore, and other industrial metals, which have fallen by 50% in the past year. China’s exports, by contrast, grew a stronger than expected 20% with a slight recovery both in the US and European Union and some weakness in the emerging economies (again, perhaps driven by the cutback in capital and consumer spending by oil exporters). We remain, therefore, bullish on the outlook for China and for the Asian markets as we look into 2016. We continue to avoid oil, mining, and property. We focus on travel and tourism, on the consumer and service sector, and financial services. I gave the keynote address at the Asia Hedge Fund Conference in Shanghai in September and was struck by the extraordinary growth and sophistication of the fund management industry in Shanghai. There are thousands of hedge funds in China and many more mutual funds, both fixed income and REITS as well as equity products. The Shanghai market crash has reinforced the need for professional wealth management, ethical standards, good accounting, and investment research. I have compared Shanghai in 2015 to Boston in 1970 with the genesis of the investment industry led by Fidelity and other major fund management houses. Apart from the US$3.5 trillion of China’s official reserves, there is another US$9 trillion in Chinese household bank deposits. In November, I expect that the IMF will certify the renminbi as one of the 5 global reserve currencies in the SDR (Special Drawing Rights). China must respond, by liberalizing its capital account over the next 12 months, and allowing its citizens to invest more overseas. Even if (a conservative estimate) 20% of the total savings in China were to be invested overseas, it will have the effect of a major wave of capital coming into global financial markets led by Hong Kong (which we see as the prime beneficiary), but followed by London, New York, and other major financial centers. I believe that the liberalization of the Chinese financial sector is the biggest thing happening in the global capital markets in the next decade. Comparisons may be drawn with Japanese capital in the 1980s, but this Chinese wave is 10 times bigger and will last a lot longer. As yields on RMB deposits are steadily reduced (and the same in Indian rupee deposits), so the thirst for yield will bring Chinese investors, as it once did Japanese investors (the famous Mrs Watanabe) into western equities. In this light, we do not believe that the US market, and other major western markets, are overvalued. There does not seem to be any evidence of an incipient recession, judging by unemployment, inflation, interest rates, the oil price, or the leading indicators. The current free cash flow of 5.2% on the S&P 500 offers better value than the long-term average of 4.9% and is already discounting a 3.8% bond yield. So even if we see (as we must) yields on US treasuries rise in the next 2 years, the stock market will still not reach a peak until the first phase of rising interest rates is over, perhaps by 2017 or 2018. Our medium-term concern, is what happens to property values, and how this impacts the banking system in China, Hong Kong, and even other locations, such as London and New York, where real asset values are extraordinarily inflated. The first signs of this property recession are now being felt in Hong Kong, where rents on commercial property in Central are being cut by 40% as luxury brands suffer the downturn in Chinese tourism. The focus in our Bamboo Asia strategy is on a range of shares in Hong Kong, China, India, Japan, and Southeast Asia, which are generally consumer, family-owned and managed businesses, not state-owned enterprises. Among companies that we have selected in this space are: Dr. Reddy’s, a leading Indian pharmaceutical manufacturer; Yes Bank, a fast-growing private bank in Northern India; Noah, which has US$10 billion under management and is the best listed Chinese wealth management group; as well as Value Partners in Hong Kong. For the National Day holiday in China this month, more than 750 million Chinese people travelled domestically; and about 400,000 visited Japan (twice as many as last year). In our investments in companies such as China Lodging, Airports of Thailand and Kao, we are trying to harness this theme of growth in Chinese tourism. We continue to research and to find very promising smaller companies which could double and triple in the next 5 years, and we think that many of the risks of a hard landing in China (not our expectation) have been fully discounted and offer compelling valuations at a micro level. P.S. We shall be issuing invitations for our investors and readers to attend a one-day conference in Hong Kong on January 13, at which we will highlight some of the aforementioned companies by inviting their management to present to our investor audience. 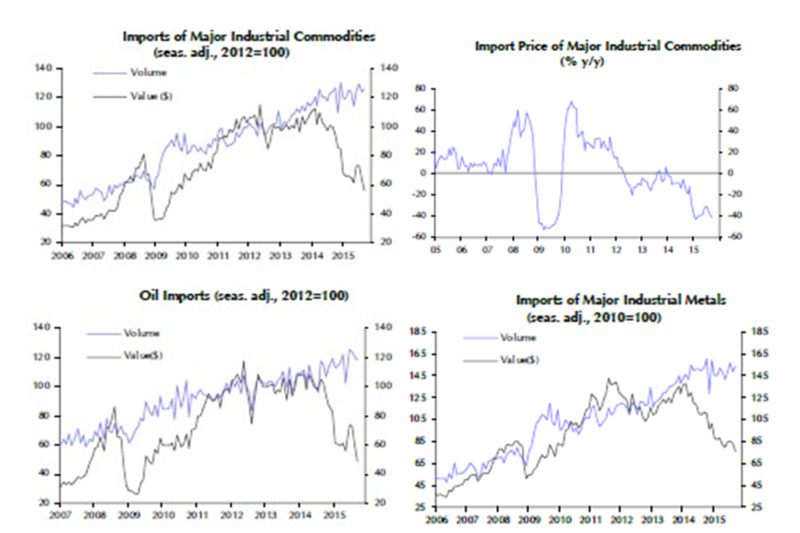 I thought that the below charts, which have been produced by Capital Economics, were pertinent to my view that China’s imports have been underestimated because of the collapse in the oil price. China is the largest consumer of raw commodities and benefits tremendously from the current malaise in the commodity markets.